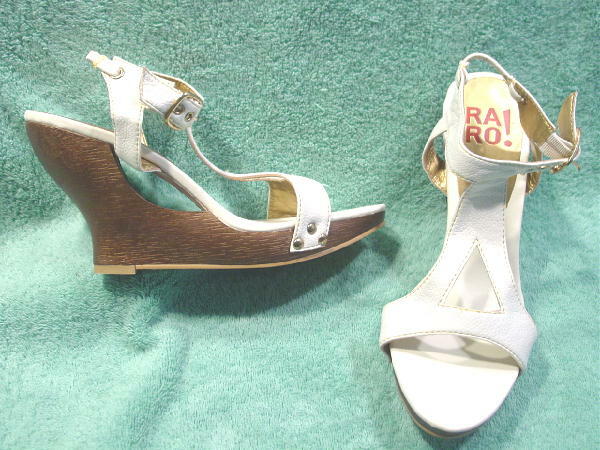 These white never-worn open toe platform faux leather sandals are by RARO!. 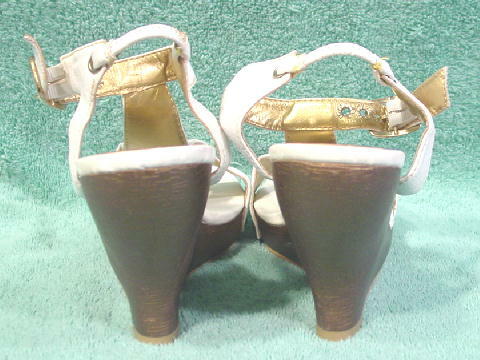 They have faux leather white insoles with gold lame slightly padded heel insets. There are ankle straps with five gold-tone rivets (holes). They have thin white elastic heel straps and the fronts have a large triangular cutout behind the vamp strap. The vamp straps are connected on each side by three gold-tone tacks. They have interesting shaped bronze-gold faux wood platforms with an arc shaped cutout below the footbed. It says size 7 on the sole, but the shoes will also fit a 7 1/2 narrow. She bought a white pair and a black pair in three different sizes. She wasn't sure which size would fit the actress.